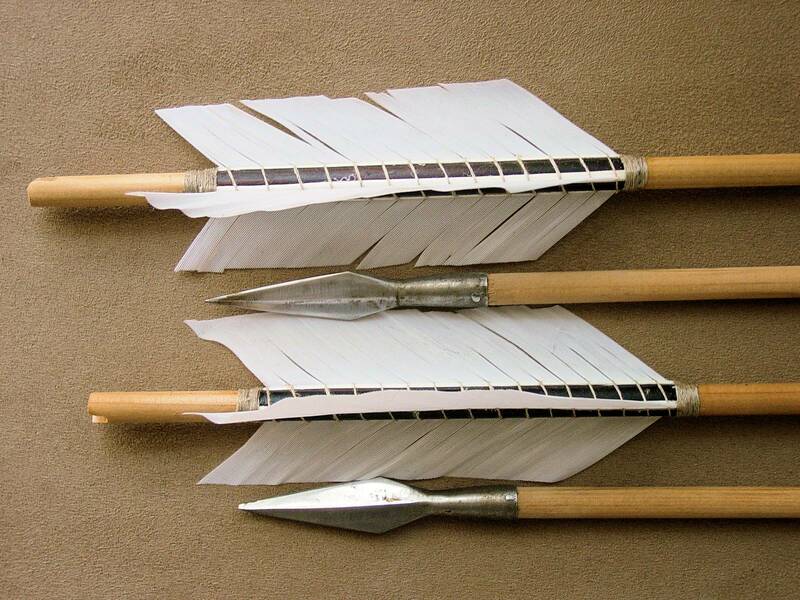 The arrows are a conjectural reproduction of a sheaf of 10-11th C hunting arrows. Materials are generally as close to those originally available, although modern alternatives have been substituted in some cases. Viking arrows of the period were about 11mm diameter at the nock and taper to between 7 and 9 mm in diameter at the head, and made from pine, birch and willow, with pine and birch being in the majority of the extant remains. The Regia Anglorum website asserts Saxon arrows were “ash, willow, aspen or pine” but doesn’t provide a source for the claim. Use of adhesives (probably birch tar) is shown on a shaft remnant found at Hedeby. This adhesive covered the entire circumference of the shaft (not just where the keels sat) and thus we are able to see that the binding starts approx 10mm from the beginning of the keel and winds around the shaft at intervals of 4 to 6 mm to the end. 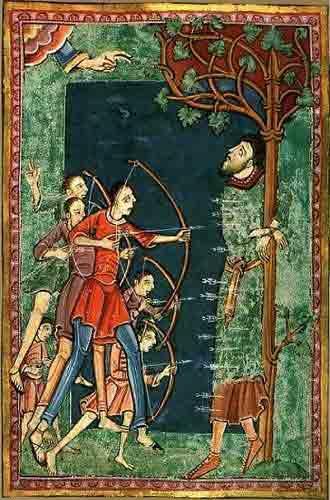 There are no identifiable differences between Saxon hunting and war arrow heads, although the Saxons appeared to have different words for each. Early heads tend to be tanged, but by the 9-10th centuries the socketed head started to become relatively common. Saxon socketed arrowheads almost always show evidence of being pinned to the arrow-shaft, and can be identified by the edges of the socket butting, rather than overlapping as on later arrowheads. A group of late 11th century Saxon arrowheads was found at Bell’s Wharf, Southwark Bridge. I’ve restricted myself to arrowheads of this type. The fletching is hand cut from wing pinion feathers of the right wing of the domestic goose, Anser anser L. The feathers are set in pitch and bound with hand-plied natural linen thread. The thread is secured with wax, there is a small quantity of modern glue holding the feather down for binding, but grip on the pitch is minimal. The shape of the fletching is taken from a number of more or less contemporary Saxon sources, notably manuscript images such as the Martyrdom of St. Edmund c 1120, the Bayeux Tapestry of late 11th century date and the Franks Casket c.700. Arrow heads hand forged MoL type 2, as found at Bell’s Wharf, although smithing variations have resulted in some being closer to type 3. They are pinned to the shaft with a soft iron pin, there is a small spot of Araldite securing the head to make it easier for me to drill and rivet. Egil rains feathery death on his house guests. Archers immediately below “Hic Est Williemo Dux” at the end of the Tapestry. Quivers are shown sitting upright on the ground in the next panel, indicating flattish bottoms. The Greylag Goose (Anser ferus), traditionally used as a source of fletching feathers in the Medieval period, is the direct progenitor of the domestic goose. I cheated and used chemically similar roofing pitch, mainly due to the higher melting point, so it won’t come off and leave black marks on everything in the car. Paulsen, Arrows and Bows from Hedeby (Pfeil und Bogen in Haithabu), in Das Archaologische Fundmaterial VI, Von Harm, Schleswig 1999 translated by H. Griffiths.